Here's a change from the miniature bird paintings that I've been doing. I was cataloging paintings from last year and the flower paintings I did last summer inspired me! Funny, to be inspired by your own work, but I guess that happens sometimes. 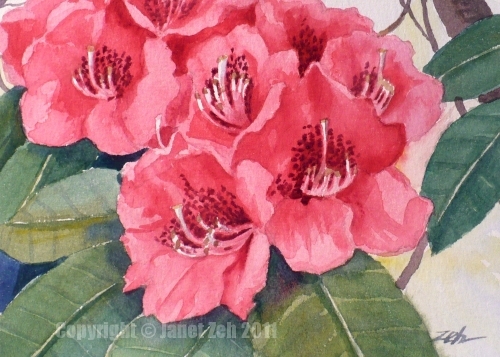 So here is a Spring flower - a lovely rhododendron painted at 5"x7" size or 12.7 x 17.8 cm. 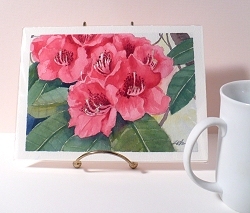 I'd painted this flower as a white rhodie last year, but it is also beautiful in this rosy pink color. This 5x7 original watercolor painting is listed in my Etsy shop: Pink Rhododendron. Thanks for stopping by - I hope you have a wonderful day!